With warm weather upon us, it’s time to fire up your grills. These Lemon Dill Chicken Skewers use simple ingredients which yield crazy, delicious flavor all grilled to charred perfection. **Update: this post and recipe have been updated since its original posting in September 2011. The recipe has been upgraded slightly as well as the photos and text. Soooo, I know I’ve shared a lot of lemon recipes lately but I just can’t help myself. I love all the lemon things and they just scream spring to me. 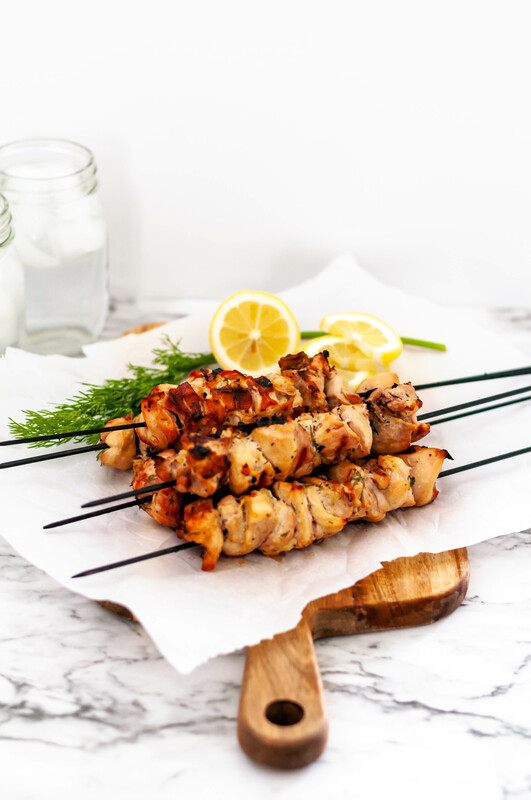 I thought it would be time for a savory lemon recipe since they have all been desserts lately so I present these yummy Lemon Dill Chicken Skewers. These chicken skewers start with a super simple marinade that I’m betting you have most of the ingredients at home already. See what I mean? Such simple ingredients but the flavor that they provide is ridiculously good. Especially when paired with lemon dill rice and some tzatziki. The marinade ingredients are whisked together then toss in the chicken to soak up the goodness for an hour. You don’t want to marinate the chicken too long since it has the acidic lemon juice in it. If the chicken sits in lemon juice too long it can start to “cook” the chicken and it will result in a weird texture when cooked. Next, the chicken gets threaded on some skewers and grilled to perfection. When it comes to the skewers, I prefer to use these metal ones over wooden skewers. They can be used over and over and won’t burn or disintegrate from the heat. After 10 to 12 minutes on the grill the chicken will be charred and juicy and perfect. Do be careful when flipping and serving them as the metal holds the heat longer than the wooden skewers would. If you’re in a pinch you can use bottled lemon juice and dried dill buuuut if you can use the fresh ingredients that’s totally the way to go. They provide so much more bright flavor. They really do make a big difference. I’m pretty sure these lemon dill chicken skewers will quickly become your go to dinner this spring and summer. Let me know your favorite grilling recipe in the comments below. Grilled Lemon Dill Chicken Skewers are super simple to make and perfect for easy summer grilling. Chicken marinated in lemon juice, lemon zest, fresh dill, salt and pepper. Grill for a few minutes and dinner is ready. Whisk together olive oil, lemon juice, lemon zest, garlic, dill, salt and pepper. Add chicken to the marinade and stir until coated. Cover with plastic wrap and marinate in the refrigerator for an hour. Preheat grill to medium high heat. Thread the chicken onto skewers. Grill first side for 3 to 4 minutes. Flip and grill another 3 to 4 minutes. These look so yummy! I love the taste of lemon and dill together. Mmmm, lemon and dill. 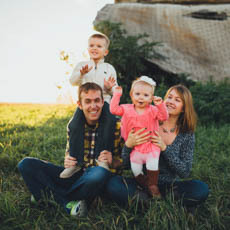 Thank you for linking to Fat Camp Friday. Enjoy your weekend! Meg those Chicken Skewers look amazing, yum! Hope you will have a great week and thanks so much for sharing with Full Plate Thursday.